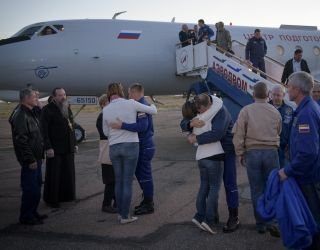 NASA astronaut Nick Hague and Russian cosmonaut Alexey Ovchinin embrace their loved ones after returning to Earth from their aborted Soyuz flight on Oct. 11, 2018. After suffering a launch failure on their way to the International Space Station today (Oct. 11), two Expedition 57 crewmembers have returned to Earth and are in "good health," NASA officials said in a news conference. Riding atop a Russian Soyuz rocket, the Soyuz MS-10 spacecraft lifted off from the Baikonur Cosmodrome in Kazakhstan at 4:40 a.m. EDT (0840 GMT) with NASA astronaut Nick Hague and Russian cosmonaut Alexey Ovchinin on board. Approximately 2 minutes after liftoff, the crew reported that they were experiencing weightlessness earlier than they expected. Roscosmos reported that one of the rocket's four boosters had failed, and this triggered the emergency escape system that sent the crew barreling back to Earth. With usual Soyuz landings, astronauts experience no more than 6 G's. This is comparable to the G-force experienced by NASA's first astronauts in the Mercury and Gemini programs. Apollo astronauts experienced about 4 G's on the Saturn V rocket, while astronauts riding in NASA's space shuttles were subjected to only about 3 G's. The most intense ballistic re-entry of a Soyuz spacecraft happened in 2008, when three Expedition 16 crewmembers experienced more than 8 G's before landing off-course. NASA astronaut Peggy Whitson was on that Soyuz and reported having difficulty breathing as the extreme G-force crushed her lungs. Her crewmate Yi So-yeon — South Korea's first astronaut — was hospitalized afterward for severe pain in her back and neck. A ballistic re-entry is kind of "like shooting a bullet out of a rifle barrel," Wiseman said. "It starts slowly spinning the descent module so that it has aerodynamic stability as it comes back through the thicker part of the atmosphere, and then the parachute comes out and they land." Hague and Ovchinin touched down near the town of Dzhezkazgan, Kazakhstan, 3 to 4 minutes after the anomaly occurred. "Ground rescue forces were on them absolutely immediately, so that was a great thing to see happen," Wiseman said. "From everything that we have seen, the crew is in great shape. They're in Baikonur, and they're healthy ... and they look real good," he added. "We are well-trained for all of these events when we're coming back in, and so the crew handled their procedures exactly as planned." In photos released by NASA and Roscosmos, both Hague and Ovchinin appeared to be in good spirits, smiling as they underwent health checks and munched on a plate of assorted nuts. According to Russia's Federal Medical Biology Agency, which has been taking care of Hague and Ovchinin since the landing, recovery teams transported the crewmembers back to Baikonur after the landing, and they are expected to return to the cosmonaut training center in Moscow tomorrow (Oct. 12).